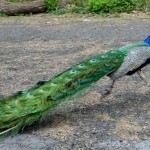 Two peacocks broke out of the Prospect Park Zoo overnight and explored Brooklyn’s biggest park, setting off a footchase and spectacle that led them across busy Flatbush Avenue and into the Brooklyn Botanic Garden. 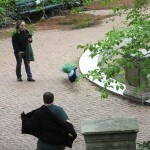 Zoo workers said the naughty peacocks had just been given the chance to go free range at the zoo, which had been keeping them penned up in the smallish aviary. 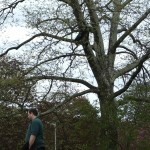 Also, it’s breeding season, so the males are showing off and looking for ladies. The morning census showed two (male) of the nine peacocks were missing. Someone called in after spotting them in the park. 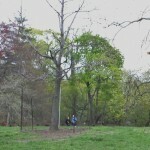 Around 9:30 crowds gathered around to see one peacock in a tree on the Long Meadow and one in a tree by the natural play area. People stayed back, especially if they had dogs. 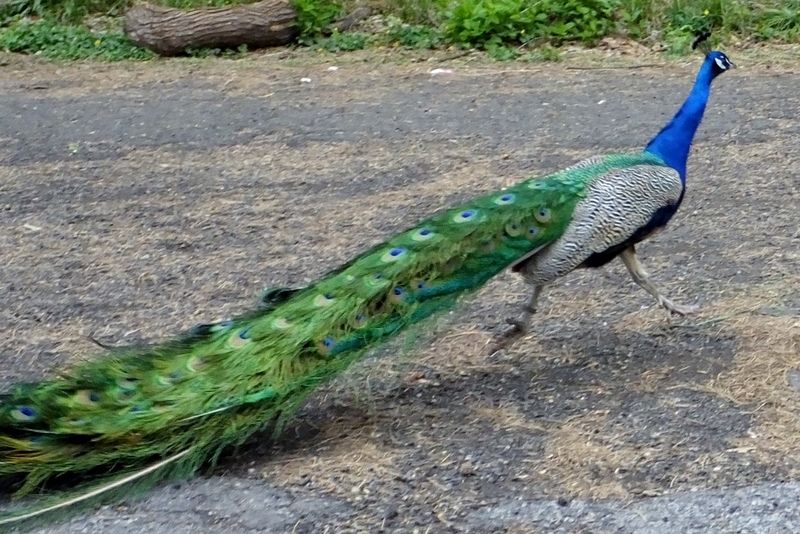 One peacock flew over cyclists and runners to the play area, where children were delighted. 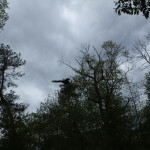 Oddly, other birds paid no attention. No blue jays or crows mobbed them. The zoo workers didn’t have any special equipment, thinking that it would be easy to catch the birds once they were on the ground. Once one bird flew, it walked into the Vale of Cashmere. 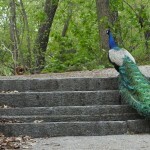 Only fitting the ostentatious bird would be drawn to the fanciest part of the park. 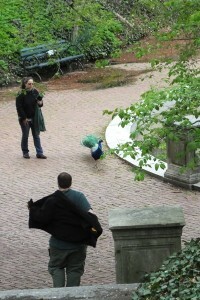 Two workers tried to pen in the peacock with their jackets. He got away. 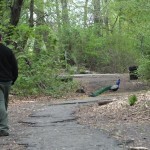 At some point I ended up face to face with a peacock on a path. I stopped, not wanting to move him further. But then a zoo worker came and he was on the run again. I got worried because it was just one worker following the bird on foot, heading down a path that would cross the out-of-control cyclists on East Drive. So I tried to head him off, but he turned another way anyway. Two workers almost caught him near a fence, but again that peacock was too fast. And they had no net. I worried he would end up in traffic at Grand Army Plaza, but then I saw people excitedly taking pictures and pointing at trees across Flatbush Avenue in the Brooklyn Botanic Garden. And this wasn’t just the usual crowd of serious birders, who were out in force for warbler migration, but, as usual, pretty much unmoved by a big fun bird. Zoo workers saw them in the garden, too, so I assume the chase continues. 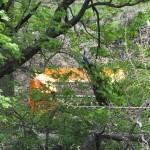 The birds should be fine–so long as they stay away from traffic, cats and dogs. A few roam around by St. John the Divine and do just fine.